I promised a screen shot of Accepted.com in 1996 and here it is. I feel like I’m displaying my high school year book picture. How dorky and dated can you get? Fortunately, Accepted.com wasn’t created to advise on graphics or web design. Its mission was, is, and will be to enable applicants to achieve their dreams by helping them present themselves at their best in their applications. Over the July 4 weekend in 1996 I uploaded this first version of Accepted.com, which I had painstakingly programmed myself using a piece of shareware called Hotdog. 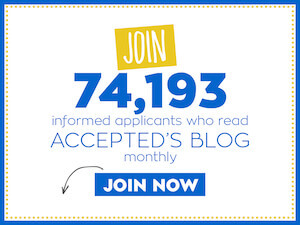 Today, the Accepted.com staff, professional webmaster, and I look back on a decade of growth and success advising applicants to graduate and professional schools. We would like to thank each and every one of you — Acceptees all who have used our services, purchased our products, taken advantage of the free articles on the site, subscribed to our free monthly admissions newsletter, and/or participated in admissions chats and teleseminars. To celebrate ten years on the web, we are taking 19.96% off the price of all our ebooks and CDs thru July 8, 2006. We rarely discount all our info products. So grab the opportunity to acquire insightful admissions help, save money, and celebrate Accepted.com’s first decade on the web . Last updated on July 2, 2006.